Chose an option 20" 21" 22" 23" 24" 25" 26" 27" 28" 29" 30" 31" 32" 33" 34" 35" 36" 37" 38" 39" 40" 41" 42" 43" 44" 45" 46" 47" 48" 49" 50" 51" 52" 53" 54" 55" 56" 57" 58" 59" 60" 61" 62" 63" 64" 65" 66" 67" 68" 69" 70" 71" 72" 73" 74" 75" 76" 77" 78" 79" 80" 81" 82" 83" 84" 85" 86" 87" 88" 89" 90" 91" 92" 93" 94" 95" 96" 97" 98" 99" 100" 101" 102" 103" 104" 105" 106" 107" 108"
Chose an option 20" 21" 22" 23" 24" 25" 26" 27" 28" 29" 30" 31" 32" 33" 34" 35" 36" 37" 38" 39" 40" 41" 42" 43" 44" 45" 46" 47" 48"
The height of the table should exclude the thickness of your table top and be the desired sitting height, or the height of the frame when in the lowest position. Chose an option 18" 19" 20" 21" 22" 23" 24" 25" 26" 27" 28" 29" 30" 31" 32" 33" 34" 35" 36" 37" 38" 39" 40" 41" 42"
A custom desk pipe base that can be used with any table top. Now you can build and work at your own unique desk. Our modern pipe desk base allows you to support any rectangular table top. 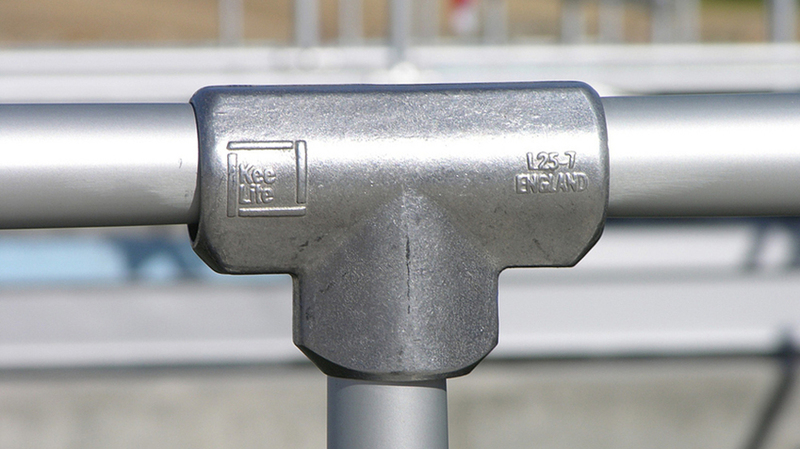 The pipe and fittings base offers clean lines and industrial strength. The kit is easy to assemble and you will enjoy the assembly just as much as the finished project. Our customers have been making desks with pipe and fittings for years. 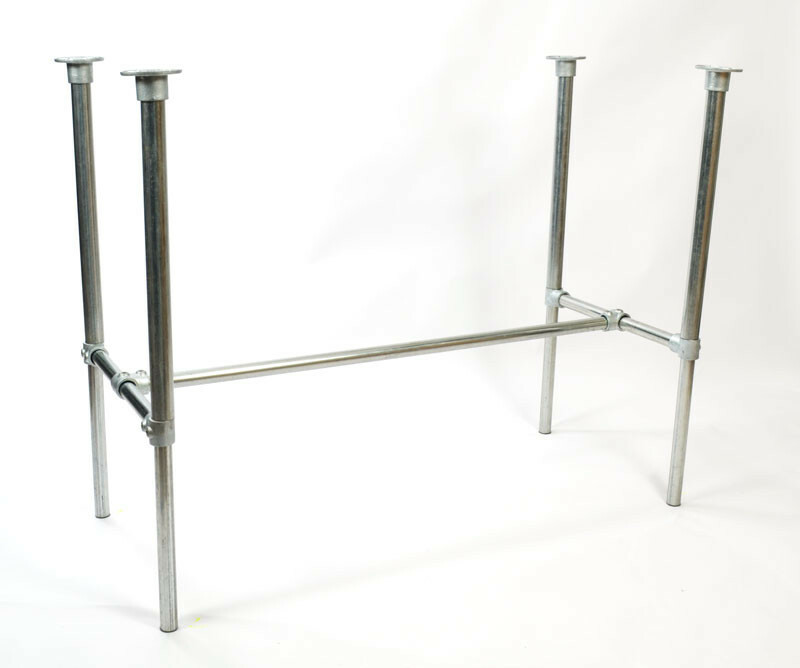 Our Simple Table frame kits now make building and configuring your own pipe desk even easier. With the adjustable height you can sit or stand! With a few simple adjustments, you can move the desk from standing to sitting position. This desk is not designed for "on the fly" type adjustments, but it's great when you want to make a longer-term move toward sitting or standing. It also allows for finite height adjustment which means you can customize the height to just about anyone. This is a great desk for co-working and office spaces where multiple people may use the same desk over time. It's Simple! You provide the table top and we provide the base. Just about any flat, rectangular surface can be made into a desk. Go on a creative journey and find a table top that works for your environment. Go green and upcycle an old piece of material, or buy something new like this simple table top from IKEA (pictured above). 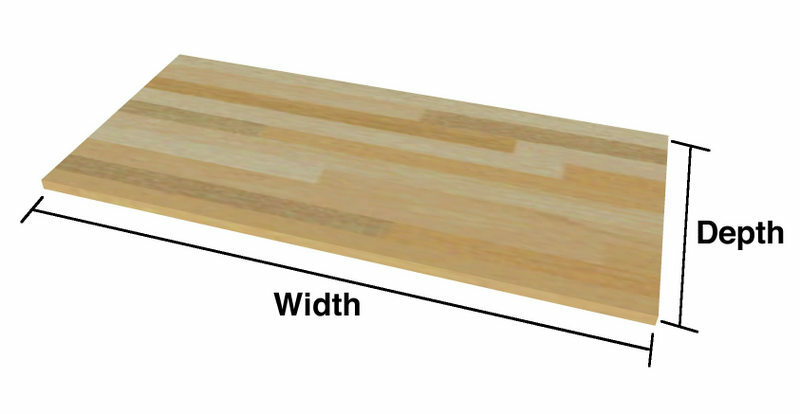 1) Start by inputting the size of your table top - enter width and length (round up to the nearest inch). The center of the leg pipes will come in about five inches from the edge of the table top. 2) Tell us how tall you want the frame. Use the diagram below to guide you. Can I adjust the bracing in the table? 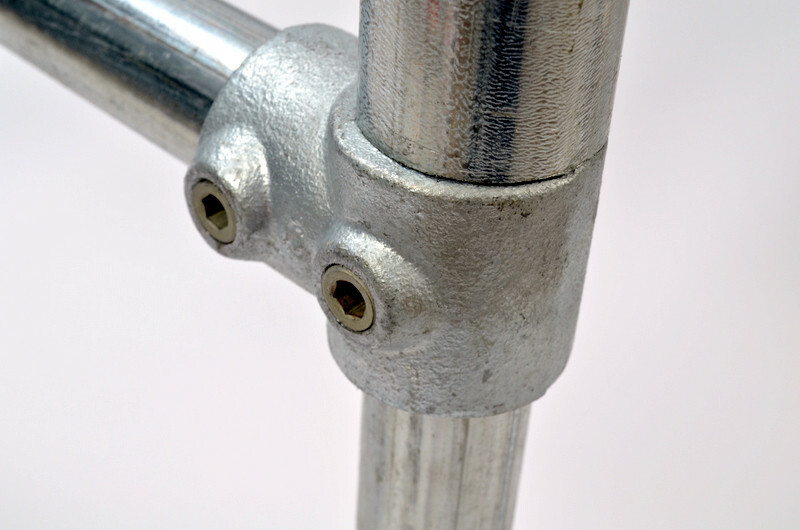 The Basic and Rugged table kits have independent bracing that can be adjusted to any desired height. 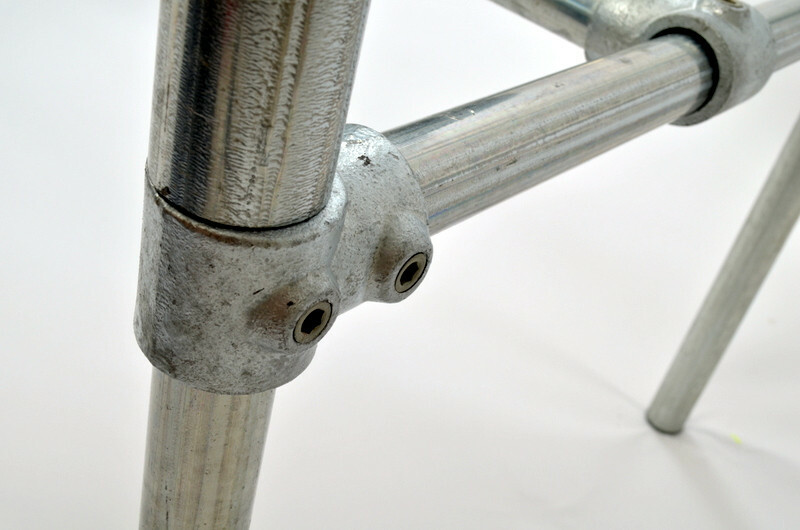 At standard table height, the location of the bracing will not dramatically affect the stability of the table. 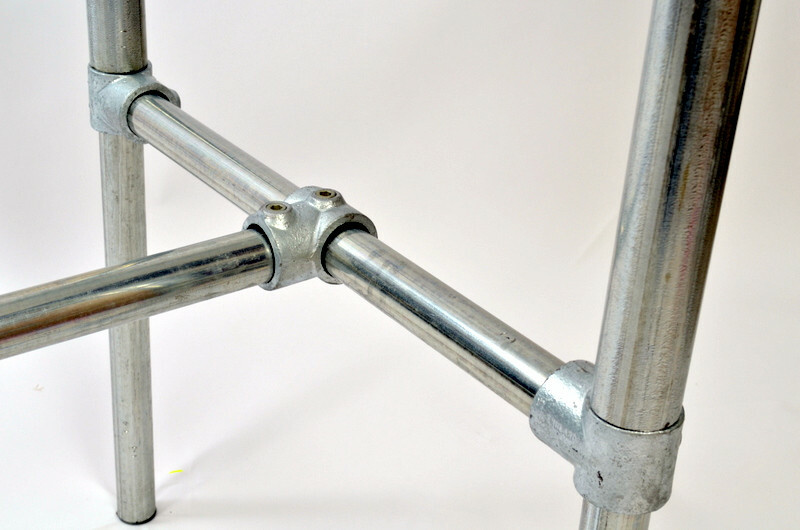 The Z-frame and Adjustable table supports cannot be adjusted vertically. 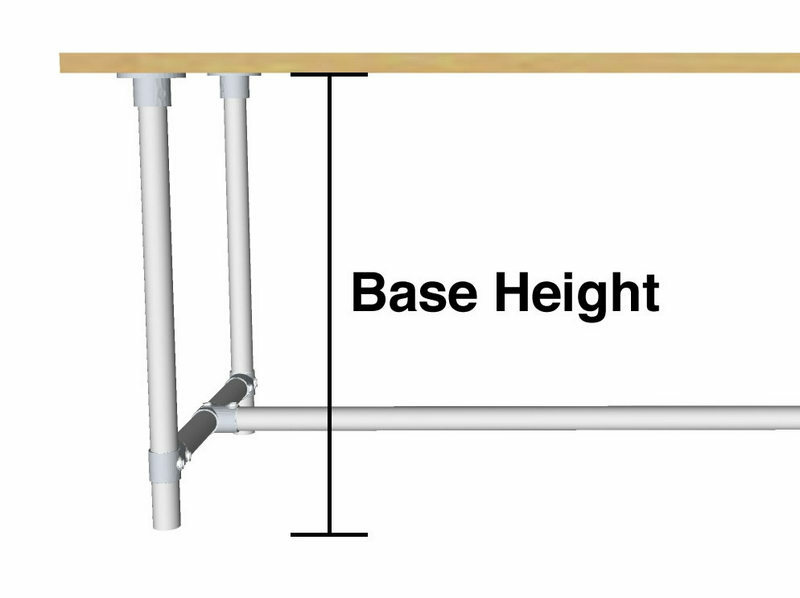 The horizontal bar on the Basic, Rugged, and Adjustable Height desk kits can be moved forward or backward. This enables it to be brought forward to be used as a foot rest, or pushed back to be moved out of the way. What size are the caster wheels? 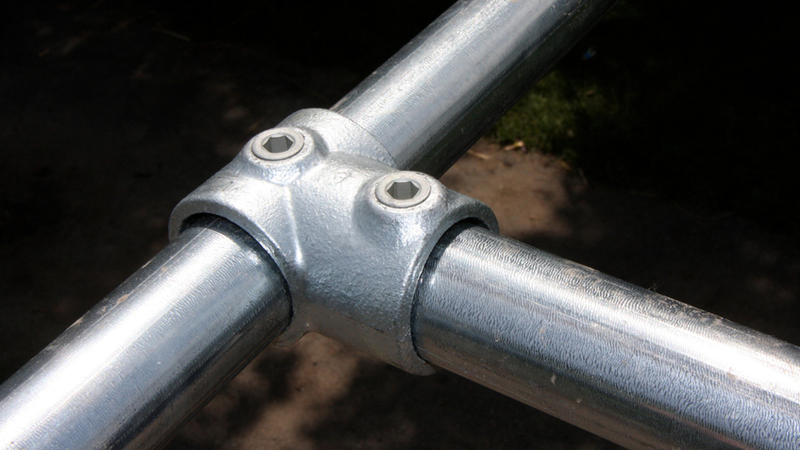 The casters that are used for the caster footing options are 3 inches in diameter. 4 inch and 5 inch casters are also available. Contact our sales team to order a kit with larger casters. What size pipe is used in the table kits? Most of the kits use Size 7 Gator Tube with a 1.66 inch outer diameter. 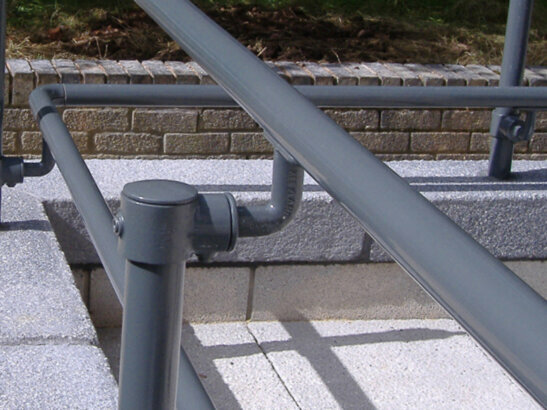 This pipe has a corrosion resistant finish and is suitable for outdoor use. The adjustable height kit also uses Size 6 Gator Tube with a 1.32 inch outer diameter in its extension legs and bracing.